Sebouh Majarian, assistant director of new media at UMass Lowell, operates one of the Tsongas Center’s four Hitachi Z-HD5000 cameras. The University of Massachusetts Lowell (UMass Lowell) has expanded its complement of Z-HD5000 cameras from Hitachi Kokusai to boost its live production capabilities and take optimal advantage of expanding distribution opportunities. The multi-purpose Tsongas Center facility is home to the NCAA Division I UMass Lowell River Hawks hockey and basketball teams. The 7,000 set venue is owned by the university and managed by Spectra Venue Management, a Comcast Spectacor business. The venue also hosts a variety of non-sporting events including concerts, job fairs, graduations, and major university activities. An agreement between the NCAA’s America East Conference and ESPN to bring live basketball games to multi-screen sports network ESPN3 created the need for the Tsongas Center to upgrade its video equipment roster. Previously using two Hitachi Kokusai Electric America (Hitachi Kokusai) Z-HD5000s alongside other vendors’ cameras for productions shown on the venue’s in-house video boards, the university and Spectra’s on-site team chose to standardize on Hitachi cameras for their ESPN3 broadcasts, in-venue displays, and other distribution outlets. 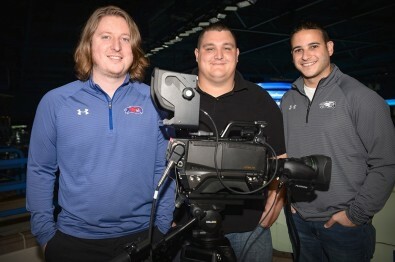 The video team at the Tsongas Center at the University of Massachusetts Lowell with one of their Hitachi Kokusai Z-HD5000 cameras. L-to-R: Nolan Mercer, Ben Jewart and Sebouh Majarian. Four Hitachi Z-HD5000s are now used for the university’s live hockey and basketball streaming broadcasts. Two of the cameras are stationed in fixed positions capturing high and tight shots, while the other two Z-HD5000s are operated handheld at ice or court level. While the school’s ESPN3 broadcasts typically use freelance crewmembers, other event productions often use current and former students as camera operators, making the Z-HD5000’s short learning curve valuable. Sports from the Tsongas Center are now streamed live on ESPN3, the America East Conference website or the university’s own site. Beyond the streaming broadcasts, the shooting flexibility provided by the Hitachi cameras and accompanying Fujinon lenses has elevated the center’s in-venue productions and raised fan involvement. “Whether shooting all the way across the court or further into the crowd, we’re now able to get great-quality video at angles we couldn’t capture before,” said Jewart.